The hackers and scammers continue to come up with new ideas to trick you into downloading a virus to your computer. The latest scheme is a pop-up in Chrome that says the page won’t display properly because you’re missing a font. Here are the details so you don’t fall for it. You’re browsing whatever sites you normally visit, and maybe a few you haven’t visited before. Suddenly the site you’re on has text that is not readable – just a bunch of characters that don’t make any sense. I have to admit, this error message is pretty well crafted. It has the “clean” look of a message from Google. The spelling and grammar are much better than we usually see from virus creators. The “Update” button looks accurate, as does the Chrome logo in the top right. And since the text on the screen (behind the error message) is unreadable, it makes perfect sense that the website is using a particular font that you don’t have installed as part of Chrome. So there is seemingly nothing suspicious about the message that tells you you need to update your Chrome Font Pack. So it’s pretty easy to understand why someone would just click on the “Update” button without really thinking anything nefarious is going on. But when the update button click leads to a file being downloaded called “Chrome Font v7.5.1.exe”, that should start to raise some concerns. First, you should never download a .exe file and run it unless you are 100% sure what it is and what it will do. Second, the “Help” prompt on the screen says you should see the download file called “Chrome_Font.exe” which is different from the actual downloaded file name. Also, Chrome might even pop up a little warning to tell you that this file is kind of suspicious so you might want to think twice before running it. 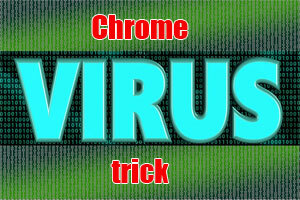 As this virus becomes more well-known, the antivirus programs in use will be more likely to catch it as well. But your best first defense is to follow the best guidelines, and never download anything if you’re not sure what it is.